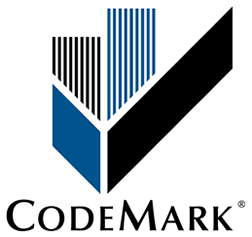 CodeMark is a voluntary product certification scheme that provides an easily-understood and robust way to show a building product meets the requirements of the New Zealand or Australian Building Code. A product can be a building or construction method, building design or a building material. CodeMark is suitable for any building product but is particularly beneficial to manufacturers and suppliers of products that are innovative, new to the market or would have serious consequences if they failed. It also provides a marketing advantage as certified products are deemed to comply with the Building Code, are listed on public Register and can use the CodeMark brand on advertising relating to the product. The wetsuit line of product has been tested and recognized compliant with the building codes of New Zealand and Australia. 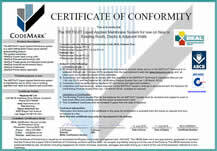 They have been awarded the codemark certificates for both schemes. Using a product under codemark scheme brings some obligations to the applicators, but also bring the safety of using a tested and certified product, as well as access to highly controlled project with these products. The applicator needs to have been certified to apply the product. This certification consists in a training on planning and preparing the project application, applying the product, controlling the application, managing the product and applying the codemark quality processes. 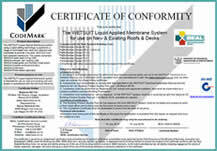 By being trained, the applicator is listed in the certified applicator registry. The application of the quality assurance processes can be audited by the manufacturer or its representative or the codemark certifier ( in this case BEAL).